The incident occurred yesterday afternoon. File photo of a coast guard helicopter. A MAN WAS taken to hospital yesterday after he fell four metres off a cliff path in Howth. The Irish Coast Guard emergency operations centre received a call from Dublin Fire Brigade yesterday afternoon that a man (30s) had fallen off the cliff path at Howth head. The cliff rescue team along with the the Howth lifeboat were tasked with his rescue. The Rescue 117 helicopter from Waterford was also tasked but was stood down en route to Howth. The team worked with Dublin Fire Brigade paramedics and managed to rescue the man and take him on a spinal board to a waiting ambulance. The man was conscious and breathing and had received a head injury, the coast guard said. He was taken to Beaumont Hospital where he is being treated for his injuries. The Coast Guard warned walkers to avoid going off the main paths while walking on Howth Head in order to remain safe. 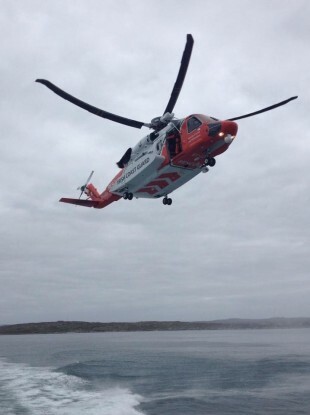 Email “Man taken to hospital after falling from cliff in Howth ”. Feedback on “Man taken to hospital after falling from cliff in Howth ”.